Pocket stones are small—under 2 inches—and typically feature singular, powerful words of special meaning to the recipient. Tucked into pockets or purses, these word stones are popular, inspirational and can always be carried close. With the stones' words engraved, your message will be long lasting, and not wear off, even if it's carried every day. Choose pocket rocks from a selection of polished or unpolished river rocks and colored glass stones. 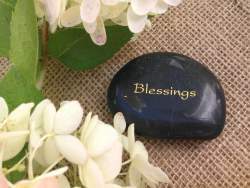 Small stones with words are popular for thank-you gifts, wedding favors, memorials, church gatherings, messages of hope and so much more. If you're in a hurry, check out the “Quick Ship” section to get your pockets stones within just a few days!